Good support. I take magnegics out. Been using this product for years. Keep them in stock. They use to be at other companies priced less. I will always have to wear this belt. I used this product for back support whenever I am going to do housework or when I go out shopping. The only two problems are: I wish it came in white and the magnets slip so I sew mine down, row by row. This is the very best back braces I have ever bought. I have had bad back problems and I find wearing a brace is beneficial t me so that I can walk. 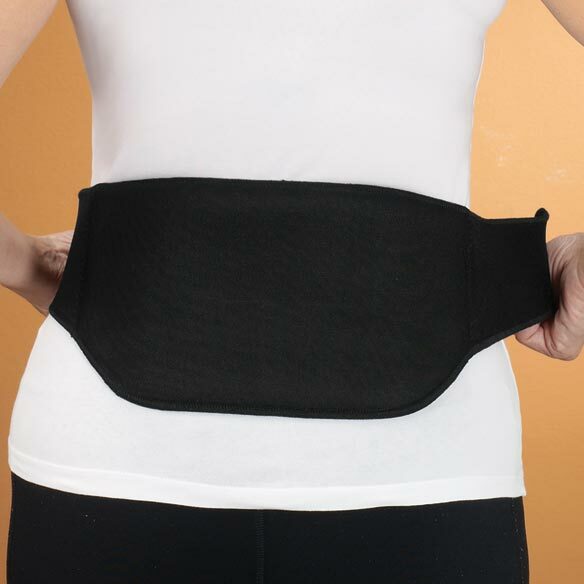 This product is lightweight and fits the small of my back very well, The magnets keep my lower back warm and flexible. Wear every night, and no longer wake up in pain every time I move. I've bought many of these ... some for us and some as gifts. When the back goes "out" ... this support is my best friend and really helps heal. I don't know HOW it works ... but it really helps a lot. My husband wears it on his job as extra support also. This #337744 magnetic back support is very comfortable when using - does a good job. Since I'm 82 yrs young, with back pain, it has helped sooth it, and I'm feeling better. I have torn ligaments and muscles in lower back and this gives me a little support when I'm out and about. I don't know if the magnets work but was worth a try. Comfortable. I bought this some time ago, rarely used, but got it back out as I've been having lower back pain. It was very comfortable and seemed to help the pain. But then I found the velcro along the upper edge ruined the cotton knit shirt I was wearing by catching on the fabric of the shirt. I'm hoping if I buy another one they may have solved this problem with their newer ones. the bag that holds the magnets wil not stay in place, tends to fold or move about, needs to be sewn onto the belt. i had this done by local seamtress. Magnetic therapy is a great help for poor circulation and pain. Chose this back brace based on good reviews. It seems to fit exactly where I need it, my low back. It also seems to be a support I can wear all day comfortably. The price seems to fit my budget. I hope it helps my back problem. A backup to one I already have. My husband has a lot of back pain. My husband has to stand and pick up large boxes. I hope this helps his lower back pain. I need to relieve my lower back pain. It has good reviews. Love it. I have suffered with back pain for 12 years. I have to wear it all the time, It also helps piriformis syndrome. have pain in back from work standing on concrete 8 hrs. it had a medium sized option and shipped quickly. Walmart doesn't have it in large size. Have one that is similar. Read the reviews and feel confident it's what I need and will be happy with. It is hoped that this belt will help with my sciatica pain. Have used this brace for years.. It helps my cranky back. I have nearly chronic lower back pain; am hoping this belt will help. Have used a magnetic belt a few years ago and it really helped. Looking around online, this one had just the features I wanted and good reviews, so seemed like a good choice. Heard that magnetic back belt works wonders for some people; thought I would try it. This one looked good; was reasonably priced. Looks comfortable and will fit underneath my shorts. I have back pain from RA/ and found that an MRI helped. I am hoping the magnetic belt will help. I have outgrown a smaller size, I use this primarily for when I shovel snow here is the northeast. I have no back pain no matter how much has to be shoveled. Have used one for years .Helps relieve back pain. look like it would work for the back support I was needing. This one either. do not remember. I get severe back pain from shoulders to my zeus. will this work, or do you suggest something else? BEST ANSWER: Speaking from the bottom of my heart and my conscience, nothing can give you more relief than this magnetic belt. I suffer of degenerative disc disease of ALL LUMBAR DISCS, the pain could be excruciating had it not be for this magnetic belt. Remember the magnet suppresses the pain sensation without letting it go to the brain. It stays in the back. In addition, the magnets promote the blood circulation in the lower back. In my instant case, I also do daily aquatic exercises in the YMCA pool. I use the back support for my low spine, my back is very severe. I have used these for years. They put support and pressure for me. As far as the magnets. I use them elsewhere. I am very sensitive. Everyone always asks me where I got the belt. I am not familiar with your issues. But I know mine is very severe. Im Still looking for help. But as far as this support belt I can not do without. Hope I could help. This helps w/ back pain around the waist and and lower back. You can put it around a shoulder or even around head for headache. I have used magnets for many years. what gauss are the magnets? BEST ANSWER: Thank you for your question. The magnet strength for the back support is 900 gauss. We hope this information will be of help to you. I have a 38 waist should I get a medium or large? BEST ANSWER: Thank you for your question. You should get a medium. We hope this information will be of help to you. does it come in white or neutral? BEST ANSWER: Thank you for your question. Unfortunately, the Magnetic Back Support only comes in white. We hope this information will be of help to you. can you show me the front of the belt ? BEST ANSWER: The front of the belt is very simple, you just lap one side over the other. Velcro closier. Holds very firmly and doesn’t slip. I love this belt. I were it over my shirt or I think I will try it with a little bit of pain rub on it, out of a tube with all night extra heat. I have a neck wrap that is made similer, and it has healed my neck. I only need it now and then now. The front straps are 3 inches in width and adhere to each other. Fit snugly and are comfortable when wearing the belt and I wear mine on a daily basis. The wide part of the belt that holds the magnets goes on your back area. The front is the straps that tighten to your comfort. I returned the belt. I did not like the strength of it, way to flexible for my back. Are magnets sewn in belt? BEST ANSWER: Thank you for your question. The magnets are sewn into the support. We hope this information will be of help to you. Sort of. We had to reinforce what was there. Other than that, a great product! I wear it everyday. How many Gauss are each magnet, and what is the total for the back brace? BEST ANSWER: I don't know what "Gauss" is/are, but there are 28 magnets in the support. I LOVE it and sleep in it every night. When my back gets cranky, I strap it on and wear it under my clothes. I highly recommend this product. Thank you for your question. The gauss rating is 900 and there are 28 total magnets. We hope this information will be of help to you. Is the 900 Gauss for each magnet or the total amount for all 28 magnets. can I see the front of this brace? BEST ANSWER: The front of the brace is the velco straps that keep it attached to each side. It is a good magnetic back support, but I also think it could be stronger and more stable on your body. I did enjoy it for some time, but then found I needed more support for my back. Thank you for your question. Unfortunately at this time we do not have a picture of the front. The straps are thinner than the back in width and are velcro shut. We hope this information will be of help to you. how does it look in front? BEST ANSWER: Thank you for your question. The front is the strap and closure so it is thinner then the back support itself in the picture you see. We hope this information will be of help to you. You really can't tell you have it on. You don't see it. Looking for support down low on back how far down from waist does it fit? BEST ANSWER: I have a magnet brace already and looking for another one, as my Velcro is wore out. Does this one have a row of magnets in the middle where the spine is, or does it run down both sides of the spine? I have protruding spineous processes, and need to make sure I order right kind for me. Thank you for your question. The back piece itself is 11 1/2" long by 6 1/2" tall on all of the sizes that we offer. We hope this information will be of help to you. What kind of magnets are used? BEST ANSWER: Thank you for your question. The back support uses permanent magnets. We hope this information will be of help to you. what size if I am 32 waist? BEST ANSWER: Thank you for your question. You would order size medium. We hope this information will be of help to you.